1Registration is limited to 600 delegates. 2No cancellation requests for late registration will be considered. 1. Registration for the conference is limited to 600 delegates due to space restrictions at the conference venue. Registration for the conference is on a "first come, first served" basis. Technical Sessions: Special and Scientific Theme Keynotes, as well as Oral and Poster Presentations. 11 IKC Field Trips: Access to registration on a “first come, first served basis” for field trips which offer the unparalleled opportunity to visit any of the major diamond mines in southern Africa and more. Preferential Hotel Rates: Reduced room rates for onsite hotels (up to 40% off rack rates). Discounted Airfares: Reduced fares on Star Alliance airlines (up to 20% off). Opportunity to Submit an Abstract: to apply to participate in the technical sessions. Conference Proceedings Volume(s): one hard copy (subject to sufficient 11 IKC post-conference funds). 4. 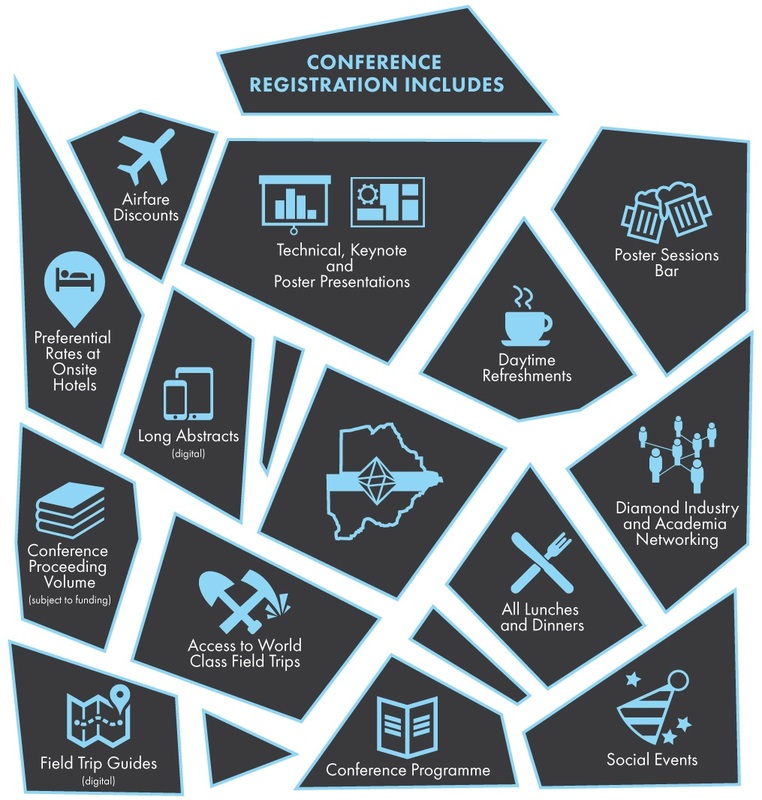 Any accompanying person wishing to attend all or part of the conference technical sessions needs to register as a full delegate and pay the full registration fee. Accompanying persons will be required to complete a PDF form with similar details to those provided by delegates during the registration process. The form will be provided with registration confirmation. 5. The full delegate and accompanying person conference registration fee increases on 16 May 2017. Late registration rates are BWP20,000 for full delegate conference registration and BWP9,000 for accompanying persons registration. Late registration fees are non-refundable. 6. Delegate and accompanying person conference registration ends on 01 September 2017. 7. In order to be able to attend the conference, delegates and accompanying persons must sign and submit to the Conference Secretariat the 11 IKC Liability Waiver and Consent Form by 15 August 2017 if not already submitted as part of field trip registration. 8. Fully registered conference delegates and accompanying persons may pick up their registration kits from 13:00 Sunday 17 September 2017 onwards at the 11 IKC Registration Desk in the Gaborone International Convention Centre (GICC). 9. Registration fees do not include travel or accommodation. 10. Information provided via the 11 IKC website should be considered provisional until the conference registration opens. 11. General conditions of registration (see below) apply. See Field Trips page for a summary of fees. 1Field trip registration requires at least a 10% non-refundable deposit on conference registration. 2Remaining balance of conference registration fee is required by 01 March 2017. 3Please note Field Trip 9 registration will remain open until 15 August 2017. 1. Registration for field trips is on a "first come, first served" basis (limited to one place per field trip for each registered delegate or accompanying person). Maximum capacity for each field trip is at the discretion of the field trip leader and provided on the relevant field trip pages. Conference delegates unable to obtain a place on a particular field trip can select to be added to a waiting list. 2. Conference delegates and accompanying persons will not be considered for field trip registration unless they have paid at least a 10% non-refundable deposit of the conference registration fee. Full payment of the conference or accompanying person registration fee is required by 01 March 2017. 3. Registration by conference delegates or accompanying persons for the field trips requires full payment of the appropriate field trip fee at the time of field trip registration. 4. If any of the field trips are cancelled by 11 IKC prior to 01 April 2017 for reasons such as, but not limited to, insufficient participation, field trip payments will be refunded in full. However, delegates may be offered places on other field trips, which they can accept at their discretion, and transfer any previously paid field trip fees. Minimum capacity for each field trip is at the discretion of the field trip leader. 5. Refunds for field trip registration fees due to delegate cancellation will be refunded less a 10% administration fee if cancellation occurs prior to 01 March 2017. Delegate cancellation between 01 March and 01 May 2017 will be refunded less a 50% administration fee. There will be no refunds for field trips after 01 May 2017 for delegate cancellations. 6. In order to be able to attend the field trips, delegates and accompanying persons must sign and submit to the Conference Secretariat the 11 IKC Liability Waiver and Consent Form by 15 May 2017. 7. All persons undertaking field trips do so at their own risk. Field trip participants should anticipate being required to complete waivers of liability or indemnity forms as required by properties being visited. Participants are also required to supply personal information such as full names, age, gender and passport numbers with expiry dates at the time of registration and a passport scan must be supplied by 15 May 2017. Please note that there may be restrictions during field trips with regards to security, sampling, alcohol testing, photographic and other electronic equipment. Participants are expected to comply with the Semi-Precious and Precious Stone Protection Act in the corresponding jurisdiction. Any diamond(s) found by field trip participants (pick-ups) remain the property of the host mine or project and should be handed to mine/project officials immediately. Field trip participants may have to undergo safety and security inductions prior to mine visits. 8. Field trip participants (delegates and accompanying persons) while on company properties such as mines are subject to all company regulations, safety, security and other procedures and restrictions. They may reserve the right to restrict admittance. Failure to comply will result in the delegate being required to withdraw from the trip at that point at their own cost. 9. Please note that for some field trips you are required to arrange your own transport to and from a starting and finishing point. Details are provided on the appropriate web page. 10. For all field trips it is essential to ensure that any appropriate additional documentation required for entry to those countries has been obtained prior to the conference. The 11 IKC is not responsible for any costs or inconvenience incurred should the delegate not be permitted entry to, or departure from, those countries. 11. Field trip leaders have the right to require that a participant withdraws from the field trip immediately, at their cost, should that participant demonstrate inappropriate behaviour or jeopardise the safety and security of other field trip participants. 12. Participants on a field trip must ensure that they have an adequate supply of any medications, money (in the appropriate currency) etc. that they may require during the trip. In order not to interfere with field trip schedules, unplanned stops will not be possible. 13. General conditions of registration (see below) apply. Payments are to be made by credit card or electronic funds transfer (EFT) via the 11 IKC Online Registration which opens 12 September 2016 at 08:00 PT or 16:00 GMT. For EFT payments, details will be provided in the registration confirmation email. Please ensure EFT payments are received by 11 IKC within two weeks of each registration or the respective registration deadlines, whichever comes first. In case of a problem with payment please contact the Conference Secretariat. All field trip and conference registration fees are denominated in local currencies. At the time of payment, registrants will be charged the USD equivalent of the respective registration fees. The exchange rate used by 11 IKC will be updated every week on Friday at approximately midnight GMT. Full payment is required when registering for all items (eg field trips) except conference registration. Delegates and accompanying persons have the option to pay conference registration in two parts. A 10% non-refundable deposit is required to secure conference registration and allows delegates to register for field trips, apply for financial support and submit short abstracts. To pay only 10% of the registration fee, click the 10% payment box inside the “Total Payment” section on the "Preview and Payment” page of the online registration process. Full payment of conference registration is required by 01 March 2017. If full payment is not received by 01 March 2017, the conference registration will be cancelled, including any field trips, oral / poster presentation(s), associated accompanying persons, and any other items, in accordance with the refund policy. See Important Dates for more details. All requests for cancellations of full delegate registration, accompanying person registration or field trip participation must be received in writing by post, e-mail or fax by the Conference Secretariat. Cancellations will not be accepted by telephone. All cancellations are subject to the limitations specified above and elsewhere on this website. Delegate and accompanying person standard conference registration fees, if paid in full, will be refunded less a 10% administration fee until 01 March 2017. All 10% deposits are non-refundable. From 01 March to 15 May fully paid registration fees will be refunded less a 50% administration fee. There will be no refunds after 15 May 2017. Late registration fees are non-refundable. Refunds for field trip registration fees resulting from cancellation by a delegate are less a 10% administration fee before 01 March 2017. Between 01 March and 01 May 2017 refunds will be 50% of the field trip registration fee(s). There will be no refunds after 01 May 2017. Field trip participants, full conference delegates and accompanying persons must be over 19 years. There will be no onsite delegate or accompanying person conference registration for technical sessions or field trip registration. Registration fees for the conference for both full delegate and accompanying persons (normal and late), and all field trip fees are not transferable. Please see Cancellation and Refunds for further details. It is expressly agreed that the members of the Organising Committee and the Conference Secretariat for 11th International Kimberlite Conference (11 IKC), their legal representatives, directors and employees, and their agents, officers and services, shall not be liable for any loss, injury or damage of any kind whatsoever suffered directly or indirectly by the person, possession or property of a conference participant or other person during or in connection with the events on the programme or any other activities of 11 IKC (inclusive of field trips) for any reason whatsoever no matter howsoever caused. It is agreed that the Organising Committee and the 11 IKC Conference Secretariat, and their agents and officers, reserve the right to cancel at any time any, or all, of the programmes or other activities if this should appear necessary as a result of events which are beyond their control or which they cannot reasonably be expected to influence or for which they are not responsible. Without limiting the generality of the foregoing, such events shall include force majeure, government or other official regulations, natural disasters, strikes of any kind whatsoever, civil, international or other crises, or any other unforeseen occurrence. Decisions regarding the necessity for such cancellation shall be taken by the Organising Committee, or their agents, at their sole discretion and shall be final. The Organising Committee reserves the right to change any aspect of the conference and field trips as they see fit (the 11 IKC website will be updated accordingly when possible). All costs presented here are estimates and may not reflect the actual cost in 2017 due to circumstances beyond our control. The 11 IKC Organising Committee reserves the right to refuse admission to the conference at the Gaborone International Convention Centre, or participation in any other 11 IKC activities at other venues or participation in all or any part of the 11 IKC field trips to any delegate who is considered by the 11 IKC Organising Committee to be a security risk and/or a disruptive influence on the orderly conduct of all aspects of the 11th International Kimberlite Conference. It is the sole responsibility of each registrant to obtain all necessary travel documentation required to participate in the conference as well as any of the field trips they are registered for. The 11 IKC is not responsible for any costs or inconvenience incurred should the delegate not be permitted entry to, or depart from Botswana or any of the countries or properties visited as part of the conference field trips. Please note that the general conditions of registration as well as specific conditions stated on the field trip web pages apply. 11 IKC registration fees do not include insurance for participants against personal injuries, sickness, theft or damage. This applies to any event associated with the conference including field trips. Participants are advised to obtain whatever insurance they consider necessary. Foreign visitors to Botswana, South Africa, Namibia, and Lesotho may not covered by a delegates existing medical insurance plan. We strongly recommend that 11 IKC participants, before leaving home, obtain appropriate short-term health and accident insurance that include field trip activities. 11 IKC registration fees do not include insurance of any kind. It is strongly recommended that at the time you register for the Conference and book your travel you take out an insurance policy of your choice. The policy should include loss of fees/deposit through cancellation of your participation in the Conference, loss of international/domestic air fares through cancellation for any reason, loss of tour monies through cancellation for any reason including airline or related services strikes within southern Africa, failure to utilise tours or pre booked arrangements due to airline delay, Force Majeure or any other reason, medical expenses, loss or damage to personal property, additional expenses and repatriation should travel arrangements have to be altered. The 11 IKC cannot take any responsibility for any participant failing to arrange their own insurance. This insurance is to be purchased in your country of origin.